Home BUSINESS NEWS EACC recovers 11 public properties worth sh. 780m stolen in two counties. EACC recovers 11 public properties worth sh. 780m stolen in two counties. Chairman Rtd. Archbishop Eliud Wabukala and CEO Twalib Mbarak leads a team from the EACC for site visit of all recovered assets in Nakuru and Bomet Counties valued at approximately Ksh. 780 million. Chairman Rtd. 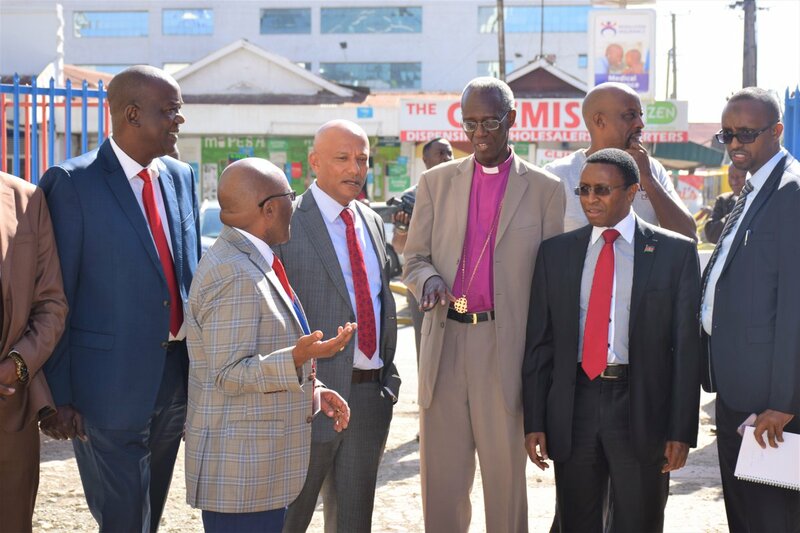 Archbishop Eliud Wabukala and CEO Twalib Mbarak on Thursday led a team of Ethics and Anti-Corruption Commission (EACC) for site visit of all recovered assets in Nakuru and Bomet Counties valued at approximately Kshs.780 Million. During the handing over ceremony held at Sarova Woodlands Nakuru, eleven (11) public properties were recovered. Among the recovered properties included four parcels of land in Nakuru Municipality measuring approximately 0.0975 hectares each and valued at a total of Kshs. 74.2 Million. A total of 27 public officers’ residences were recovered in the process. Two other blocks of land measuring approximately 0.1643 hectares each and valued at Kshs. 42 million were also recovered. The 2 parcels of land were reserved for a Survey Camp by the Department of Survey in Nakuru County. They too reposed another block belonging to the Postal Corporation which was disrupted during irregular alienation process. The land situated within Nakuru town Centre along Kenyatta Avenue and the estimated value is Ksh. 150 million. In Naivasha Municipality, 56.82 hectares (140 acres) of land reserved for research purposes by KALRO with a market value of Kshs.490 million was seized. In Sotik Township Block, EACC recovered two blocks measuring approximately 0.1615 hectares and 0.1347 hectares respectively and valued at Kshs. 4.2 million. The land was reserved for the construction of a stadium. The chairman said that EACC had taken proactive approach to prevent corruption by conducting Corruption Risk Assessments to seal corruption loopholes and Disruption of corruption. In particular, the commission has averted loss estimated at Kshs. 7.4 Billion in 2018/2019 Financial Year.